This girl originated from the well-know Sweetbriar Suri Farm, Jim & Gini Barker. Her sire is SBS Renegade, a dark brown male with 2P Angel (black) in the background, and Solid Mahogany (brown) as the grandsire. She also has Accoyo Jackpot as her paternal grandsire. Renaissance has a lot of color in her background. She was sold and later rescued from the farm that bought her from Sweetbriar. Prince Christoff's Lily (aka Lila) was obtained through a farm liquidation situation. I was impressed by her calm demeanor and beautiful fine, dense fleece, as well as her notable bloodlines from Sweetbriar Suris. She arrived in September of 2013 and underwent intensive treatment to eliminate any parasites and add weight. Her arrival weight was 90 lbs at 23 months. We are happy to say that Lila is free of parasites and has put on plenty of weight, weighing more than 140 lbs today, even after shearing! She sheared over 6 lbs of fleece in 2015. She has a very pleasant personality and is active and curious. 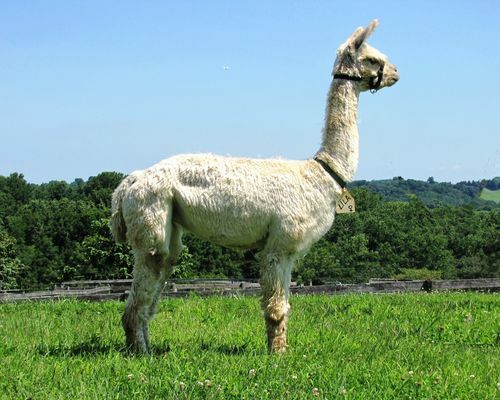 Lila has great bloodlines from Jim Barker's Sweetbriar Suri herd. Her fleece has beautiful luster and fineness and will provides years of high luster suri yarns. Because of the bloodlines, quality conformation of the sire and dam, we are breeding Lila to Shasta Springs Fusion to produce a spotted grey appy. 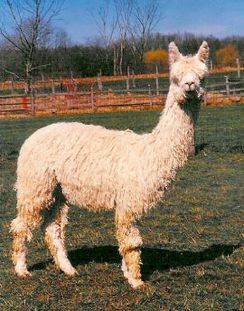 Lila's grey skin and dark nails gives a high probability to produce a grey appy cria. Lila comes with a breeding to any Wild Rose Suri Ranch herd sire, along with 45 days board while getting pregnant and a confirmation ultrasound. We recommend she be bred to Fusion, our champion "giraffe-marked" appy, or choose from full Accoyos and multi-champions. She is a bargain for her genetics and breeding! Contact Patti for more information and to schedule visit at 443-740-4240.